This brief text offers an unbiased reflection on debates about neoliberalism and its alternatives in Latin America with an emphasis on the institutional puzzle that underlies the region’s difficulties with democratization and development. 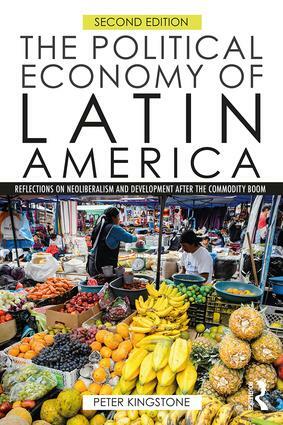 In addition to providing an overview of this key element of the Latin American political economy, Peter Kingstone also advances the argument that both state-led and market-led solutions depend on effective institutions, but little is known about how and why they emerge. Kingstone offers a unique contribution by mapping out the problem of how to understand institutions, why they are created, and why Latin American ones limit democratic development. A discussion of the knowledge economy and the limits to economic growth, with case studies of successful examples of fostering innovation. 5. Latin America’s Golden Era? Peter Kingstone is Professor of Politics and Development and co-founder of the Department of International Development (with Andy Sumner) at King’s College London. He is also co-editor of the Democratic Brazil series (with Timothy J. Power), including Democratic Brazil Divided (University of Pittsburgh Press, 2017). He writes about the politics of economic reforms and democratic politics in Latin America.